(Nanowerk News) Stanford University scientists have created a new carbon material that significantly boosts the performance of energy-storage technologies. Their results are featured on the cover of the journal ACS Central Science ("Ultrahigh Surface Area Three-Dimensional Porous Graphitic Carbon from Conjugated Polymeric Molecular Framework"). A new 'designer carbon' invented by Stanford scientists significantly improved the power delivery rate of this supercapacitor. But activated carbon has serious drawbacks, Bao said. For example, there is little interconnectivity between the pores, which limits their ability to transport electricity. "With activated carbon, there's no way to control pore connectivity," Bao said. "Also, lots of impurities from the coconut shells and other raw starting materials get carried into the carbon. As a refrigerator deodorant, conventional activated carbon is fine, but it doesn't provide high enough performance for electronic devices and energy-storage applications." Instead of using coconut shells, Bao and her colleagues developed a new way to synthesize high-quality carbon using inexpensive - and uncontaminated - chemicals and polymers. The process begins with conducting hydrogel, a water-based polymer with a spongy texture similar to soft contact lenses. "Hydrogel polymers form an interconnected, three-dimensional framework that's ideal for conducting electricity," Bao said. "This framework also contains organic molecules and functional atoms, such as nitrogen, which allow us to tune the electronic properties of the carbon." For the study, the Stanford team used a mild carbonization and activation process to convert the polymer organic frameworks into nanometer-thick sheets of carbon. "The carbon sheets form a 3-D network that has good pore connectivity and high electronic conductivity," said graduate student John To, a co-lead author of the study. "We also added potassium hydroxide to chemically activate the carbon sheets and increase their surface area." The result: designer carbon that can be fine-tuned for a variety of applications. "We call it designer carbon because we can control its chemical composition, pore size and surface area simply by changing the type of polymers and organic linkers we use, or by adjusting the amount of heat we apply during the fabrication process," To said. For example, raising the processing temperature from 750 degrees Fahrenheit (400 degrees Celsius) to 1,650 F (900 C) resulted in a 10-fold increase in pore volume. Subsequent processing produced carbon material with a record-high surface area of 4,073 square meters per gram - the equivalent of three American football fields packed into an ounce of carbon. The maximum surface area achieved with conventional activated carbon is about 3,000 square meters per gram. "High surface area is essential for many applications, including electrocatalysis, storing energy and capturing carbon dioxide emissions from factories and power plants," Bao said. 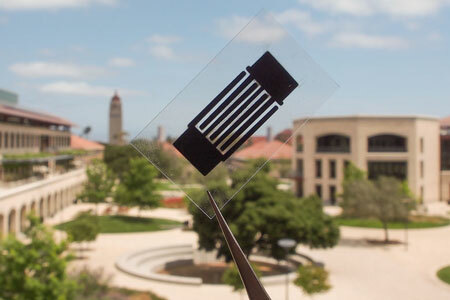 To see how the new material performed in real-world conditions, the Stanford team fabricated carbon-coated electrodes and installed them in lithium-sulfur batteries and supercapacitors. "Supercapacitors are energy-storage devices widely used in transportation and electronics because of their ultra-fast charging and discharging capability," said postdoctoral scholar Zheng Chen, a co-lead author. "For supercapacitors, the ideal carbon material has a high surface area for storing electrical charges, high conductivity for transporting electrons and a suitable pore architecture that allows for the rapid movement of ions from the electrolyte solution to the carbon surface." In the experiment, a current was applied to supercapacitors equipped with designer-carbon electrodes. The results were dramatic. Electrical conductivity improved threefold compared to supercapacitor electrodes made of conventional activated carbon. "We also found that our designer carbon improved the rate of power delivery and the stability of the electrodes," Bao added. Tests were also conducted on lithium-sulfur batteries, a promising technology with a serious flaw: When lithium and sulfur react, they produce molecules of lithium polysulfide, which can leak from the electrode into the electrolyte and cause the battery to fail. The Stanford team discovered that electrodes made with designer carbon can trap those pesky polysulfides and improve the battery's performance. "We can easily design electrodes with very small pores that allow lithium ions to diffuse through the carbon but prevent the polysulfides from leaching out," Bao said. "Our designer carbon is simple to make, relatively cheap and meets all of the critical requirements for high-performance electrodes."